Some of the excavations from the tel of Jericho show the foundation of an old tower and walls. The Tower of Jericho is an 8.5-metre-tall (28 ft) stone structure. Regular readers will remember “The Palace of Eglon” and the fact that Jericho was rebuilt by the Midianites who were still settled here at the time of Gideon. When God calls a person to service, He chooses someone who is humble and has a heart to serve others. That person, genuinely called of God, will be sensitive to God’s leading day by day. It has been said that God is not looking for ability, but availability. He often equips the most unlikely people for His purposes, great and small. God uses people who are willing to risk everything for His cause. Gideon did this when he destroyed the altar of Baal and the image which his own father had built. When Gideon built an altar to the Lord and burned the wooden image under the sacrifice to the true God, he established his leadership. He was also very human and needed confirmation from God. The sign of the wet and dry fleece gave him additional confidence. The God-called leadership of the Church was confirmed with signs of God’s presence. In Acts 2:42-47 we read of God’s confirmation of His call on the lives of the Apostles. The sign which indicated God’s call on Gideon was that the people supported him. When we recognize the call of God on someone’s life, we need to support that person in any way we can. Lord God, help me to find ways to support those You have genuinely called into some form of leadership in Your cause. I know I can’t support everyone, therefore guide me in knowing where to put my support. Bless my Pastor and in particular those who are effective in bringing new people into a relationship with You, O God. In Jesus’ Name I pray. Amen! When the Roman Catholic Bishop of Calgary, Bishop Henry, took a strong stand in favour of “one man, one woman” marriage, he was maligned terribly by those who opposed his stand. I called him on the telephone and my first words were a quote from the angel who appeared to Gideon. I quoted the old translation of the words found in Judges 6:12, “Hail, thou mighty man of valour.” He laughed and so did I. He encouraged me in my campaign to see marriage retained as it had been throughout human history. We lost that battle in the House of Commons and in the Senate of Canada. I received a call from the then Prime Minister, Paul Martin, who wanted to thank me for a book I had sent him. It was kind of him to call. However, the conversation went downhill when I said something to this effect… “Sir, you have led Canada in a direction which will eventually prove to be most destructive to the human family…God’s plan is one man, one woman.” I believed that to be true then and still do today…and I speak the Truth in love (Ephesians 4:15). I love people and, therefore, I want only what I believe would be best for everyone. I believe I’m following Jesus in this. Check out Matthew 19:4-6. 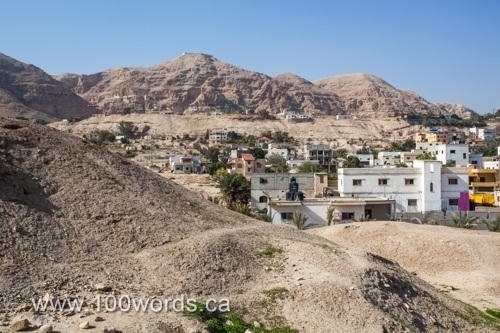 Here is a view from the tel of Jericho showing some of the modern town of Jericho. In the distance is the traditional Mount of Temptation, where Jesus was tempted by Satan following His baptism in the Jordan, not far east of here. Love today’s scripture of Gideon, the fleece and the dew and God’s Presence. Prayed David’s prayer and moved by his message. Things have certainly gone downhill with changes to the constitution of marriage in Canada and abroad. We call on God for strength. The Lord Is Peace. Amen. His blessings upon you, fellow saints. Stay safe. I have e mailed & phoned to let our MLA`s know that God`s plan for marriage is the best plan for all mankind and that the government would do well to go back to the meaning of marriage between one man and one woman! some scoff; but I tell them that `living together`has no special time in itself; there is no meaning, no vows, HOWEVER when God is involved He blesses the marriages…. I believe we should speak of when we can…. ALSO rebuke the devil always, he is in this mess up to his neck,BUT the devil is nothing…. I have to keep reminding myself that GOD KNOWS ALL, SEES ALL,HEARS ALL AND HE IS RIGHT BESIDE EACH ONE OF US AND HE HAS THE GOVERNMENT IN HIS HANDS…. Yes agree with you Beverlee. God help us, God help Canada. God help our leaders and give us leaders who will lead our nation according to your Word. We know you love our nation and we do too. God gave me strength, grace and love to visit a brother and wife yesterday and it all went well. Please pray for them that the enemy does not harass them. Pray for your brother Joy that God will meet his need. We got the freezing rain last night. Be safe saints! God bless you Ger! Yes we pray for healing for Joy`s son also pray for healing for Kathy Mainse! I might have mentioned this: we had the African Children`s Choir Watoto) from Uganda performing and witnessing and praying for those who desired to give their hearts to the Lord; it was a lovely performance and the joy in the singer`s lives was so heart warming…. Meant to say your son Joy who needs healing and may he receive your healing Lord. In your Name, Amen! Yes indeed! we need to pray for Canada, just heard the National Anthem and God is mentioned in this song;;;;Yes, Lord speak to our Leaders; may the Holy Spirit lead them to do the right thing as God`s Word says in the Bible! Agreeing in prayer for God’s plan of marriage and for children in school who are being subjected to the confusion. Glorify Yourself Lord in ALL the earth. Praise Your Name. Yes it is very confusing for the people today; we just need to keep praying for the Holy Spirit to call, gather and enlighten people about God`s Word.